Did you know that commodity corn is now so cheap that people burn it in pellet stoves to heat their houses? Corn has become a cheaper source of BTUs than sawdust. Of course if you’re buying bushels of corn from your friendly local farmer, you’ll want to clean it before stuffing in your pellet stove and setting it ablaze. Clean corn means a clean burn! That’s why the folks at CornVac.com have developed the corn cleaner. All you needs is a wet/dry vac and a 5 gallon bucket. This sucker will eat through a pickup truck of corn in 45 minutes. Here’s the results of one 5 gallon bucket of corn cleaned with the corn cleaner. 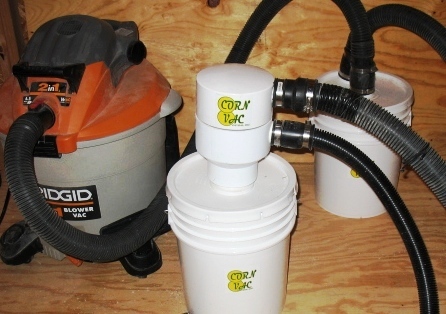 The cleaner works by using the vacuum power to lead the heavier corn one way, and siphon the lighter dust the other. It’s a straightforward machine, which makes me wonder if it might not work for cleaning any similar size of seeds. Or why not Legos? Here’s a video of the corn vac that mesmerized me. Watching all those kernels get sucked up and spit out again is the best kind of meditation. 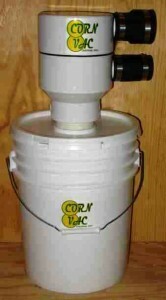 On the off-chance you have a pickup truck full of corn that you need cleaned, check out CornVac.com for more information.